Entrance Is Free. But if you wish to taste the beers then you must buy a Start Packet. At the beer stands you pay with Tokens, each beer will only be served in a specially designed tasting glass. In each glass you will receive 10 cl. To aid your entrance in to the hall we have the start packet containing a glass along with 8 tokens. The start packet costs € 20.00, pre-sales are € 15.00. Please see our web shop for the pre-sales options and discounts. If paying on the door please have the correct notes. It is possible to pay with Bancontact (minimum € 10.00 spend) or Credit card (minimum € 20.00 spend), but this will incur a € 0.50 transaction cost. Keep it as a souvenir of ZBF and take it home. If you have one from a previous year we will change it to a new one. Return it to the “Glass booth” and receive € 2.00 back, for each returned glass Zythos vzw will make a donation to charity, the Children′s cancer fund of UZ Leuven (http://www.uzleuven.be/kinderkankerfonds). No deposit will be returned on broken or damaged glasses. If you do break yours during the festival or need a second one then you can get another glass from the “Kassa glazen” for a deposit of € 3.00. At the “kassa Jetons” you can get more tokens, each one costs € 1.00. As with the start packet the minimum payment amounts are the same for cards, but you can get interesting discounts with pre-sales, see our web shop for more details. 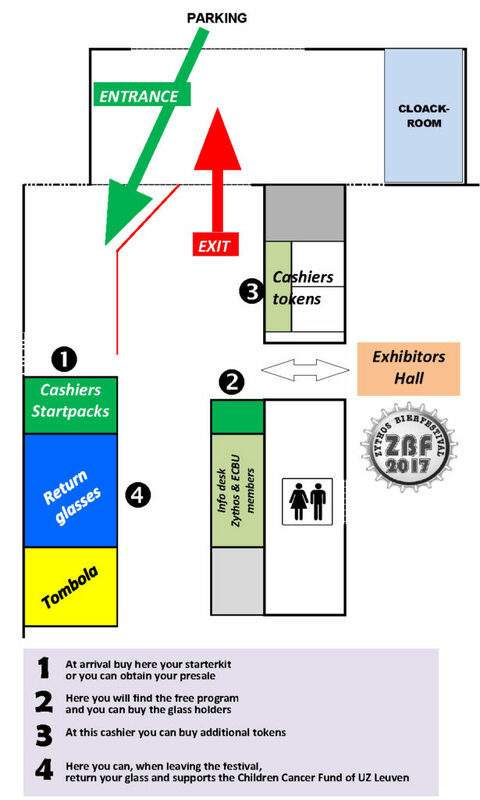 If you are already a member of Zythos or the EBCU then you will receive 2 free Tokens at the Info stand. Since 2017 breweries and beerfirms are aloud to ask 2 tokens for certain beers. You can find these beers in the beerlist. They are marked with a (2) behind the name. Zythos vzw produces a handy guide to the festival describing the beers; this guide is available in either Dutch or English and is FREE at the entrance in the foyer. If you are coming with a group and wish to avoid the long queues, then simply order your start packets, glass holders, tokens and program books in advance. You pay online and bring your confirmation with you and enter via the entrance reserved for advance sales ‘voorverkoop’. Order via this link. Your order is only confirmed once you receive your confirmation notice please bring this with you to the stand ‘voorverkoop’. For a small fee you can store your coat, hat or scarf in the cloak room at the entrance. The Brabant Hall keeps the toilets hygienically clean for all of the visitors. Since ZBF 2016 it is FREE. To park a car (1000 spaces): € 4.00 per day. The parking is managed by Brabanthal.